The research and the findings from the consultations were used to inform the development of a Local Immigration Strategic Plan for the North Shore and guide the work of the NSIIP from 2016-2021. The Strategic Plan was launched in 2016 – read about it here. We have been working with partners on the North Shore to move forward on the strategic actions and priorities identified in our Strategic Plan. See the updates on our working groups. 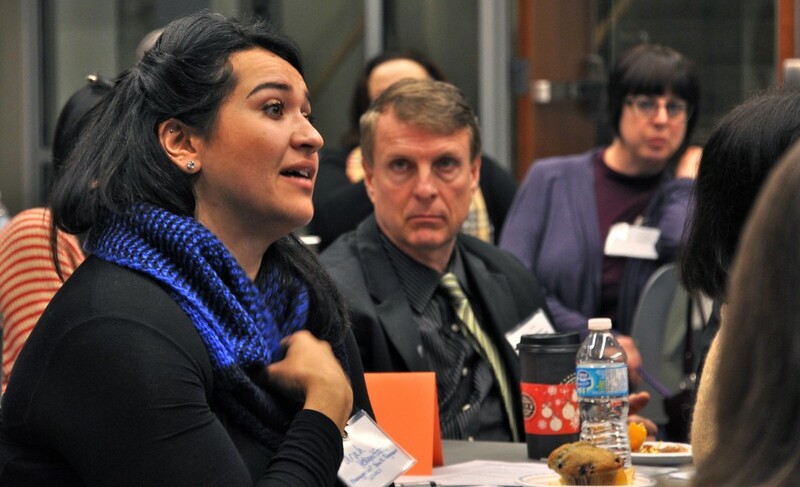 In November of 2014, 80 service providers representing 35 North Shore agencies gathered to review and provide input to current immigrant integration barriers and issues and provide direction on what needs to be done to make the North Shore a better place for newcomers. The findings from the Pre-Consultation Survey were used to guide small group discussions at the Consultation. Attendees were given the opportunity to focus on two of the dimensions where they had the most expertise and interest. In these small groups, participants were asked to identify issues related to the dimension and then to brainstorm solutions. The input captured at the Consultation has been captured in the NSIIP Summary of Community Service Provider Input. This input will be used as a starting point for the NSIIP and its stakeholders in considering what to do next in establishing the strategic priorities for enhancing immigrant integration on the North Shore. See photos from the November Community Service Provider Event here. During February and March 2015, 115 of the region’s major employers were consulted to understand the skill and labour shortages specific to the North Shore, potential employment/career entry points for new immigrants, and barriers to hiring internationally trained workers. The 115 respondents included representation from all three of the large communities of the North Shore, as well as a cross-section of “for profit”, “not for profit” and government, sectors and varying sizes of business. The findings have been captured into a four page summary as well as a full report. The NSIIP reviewed Census data to develop a two page summary of key immigrant demographic information. The North Shore – A Community of Newcomers is a snapshot that provides the demographic context for the work being undertaken by the NSIIP. In early 2015, the Project Team embarked on obtaining the opinions, perspectives and insights of immigrant on belonging and inclusion on the North Shore. In April 2015, seven focus groups with immigrants from across the North Shore were planned and facilitated. Nearly 100 individuals participated in the focus groups. All input was transcribed and later compiled and analyzed for key themes. The Summary of NSIIP Immigrant Focus Groups can be viewed here. In addition to the Focus Groups, the NSIIP Project Team supported the planning and implementation of numerous “North Shore Community Conversations”. These “conversations” are based on the principles of the Harwood Institute and the intent of this style of conversation is to provide a safe space for people to share their aspirations for their communities. The conversations were led by community partners, many of whom are members of the NSIIP. Another 100 individuals participated in these conversations. The sharing at the conversations has been compiled and themed and presented as The Summary of Community Conversation Adults and Summary of Community Conversation Teens. Between these two series of consultations nearly 200 immigrants were consulted. Youth, working aged individuals and seniors were included. Participants also came from a range of occupational backgrounds, countries of origin and lengths of time in Canada. To ensure the voice and perspectives of North Shore immigrants, the survey was conducted between June 22 and July, 2015, was completed by 420 immigrants. The full report was release in May, 2016. Over the summer of 2015, the NSIIP organized and facilitated two forums with more than 40 leaders from across the North Shore. These community leaders were asked to identify priority issues, what’s working and what needs improvement and how they might support the NSIIP and its work. The input and insights of participants have been summarized in the following full report as well as a two page summary. All research and consultation work described above was reviewed and used to develop a meaningful and measureable Immigrant Integration Strategic Plan for the North Shore. The resulting plan or blueprint will guide the work of the council and its working groups from 2016 to 2019. Read the full plan at here.